A low-VOC 2K polyurethane that may be used as a high-gloss topcoat or clearcoated to become a 2K polyurethane basecoat. Designed for fleet and OE refinishing/finishing applications. Formulated to meet both 3.5-VOC and National Rule-VOC regulations depending on reducer selection. Provides unmatched gloss and depth of image as a topcoat while offering productive tape and topcoat times as a basecoat. 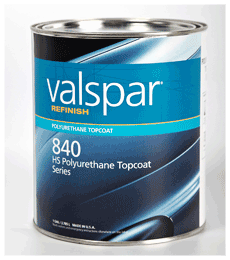 May be clear coated with a variety of Valspar Refinish clearcoats.